Dennis Fleming from New Hampshire fired one shot into the ground in the woods from his Smith & Wesson .357 which resulted in the capture of a serial burglar who had been terrorizing neighborhoods in his small New England town to satisfy his drug habit. Over ten crimes were solved due to his capture and the whole town hailed Fleming as a hero. The whole town that is except for the county prosecutor, who had the police arrest Fleming for reckless conduct, a felony, confiscate all his guns and prepared to bring him to trial and lock him up. A 61-year-old New Hampshire man who single-handedly captured a serial burglar in his town of Farmington, was arrested and charged with a felony and forced to surrender all his guns, for firing one shot into the ground in the woods which resulted in the capture of a serial burglar who had been terrorizing neighborhoods in this small New England town to satisfy his drug habit. Dennis Fleming, who has lived in New Hampshire on the family farm for 40 years had just returned from his daughter’s for lunch at about 1:45 p.m. and noticed his house was ransacked. He looked around the house to see if anything important was missing and went outside and saw a guy on the road with a knapsack over his shoulder. Going back inside, he grabbed his Smith & Wesson .357 and took a walk to talk to the neighbors and heard some noise and saw someone fall out a window of a nearby home. The thief stumbled within 10 to 12 feet from Fleming. 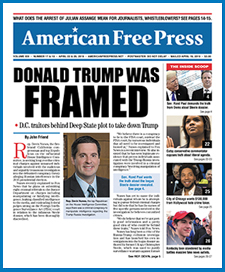 On March 16, AMERICAN FREE PRESS conducted an interview with Mr. Fleming to gain more insight into this case that attracted national attention and outrage. Mr. Fleming explained how he met the man who was just in his home. After a few minutes, four squad cars arrived and took the suspect into custody. From the several 911 calls that were placed, police knew Fleming had fired his weapon and one approached him at the scene. AFP asked why he didn’t just call the police. AFP asked how many guns he has. AFP asked if he had ever been arrested before. The next day a TV news crew showed up wanting to interview Fleming. “I’m kinda surprised it went that far,” said Fleming. AFP asked if the calls and letters were still coming in. AFP asked what happened next, after all the news interviews ended. When Fleming went to see the attorney, he found out the county prosecutor had dropped all charges. “I was pretty sure in my heart they would never indict me for it,” said Fleming. To further illustrate the absurdity of arresting Fleming, the burglar confessed to robbing several other homes. “He admitted to the police that he was an addict,” explained Fleming, and also fessed up to other robberies. It was all thanks to you, said AFP. Fleming has a warning for people across the country. AFP asked if this arrest and felony charge will be on his record.